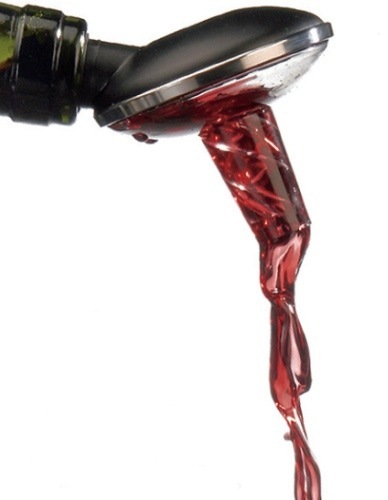 If you’ve spent more than 0.7 seconds searching the Internet for wine-related products and accessories, you will already no doubt be familiar with aerators, those versatile solutions for modern wine living that promise to mellow and round-out your wine by exposing it to copious amounts of air. This is supposedly the same as decanting a wine for an extended period of time, but claiming to achieve the results much more quickly (in seconds vs. hours). Decanting works wonders on many an old fine red wine, and often on less fine younger wines, by increasing the amount of surface area of a wine exposed to air. Air then works its chemical miracles to help release aroma compounds in the wine, essentially speeding up the aging process, which for fine red wine more-or-less follows a curve over time from tight/harsh to yummy to vinegar. Notice I said “fine red wine” and not “red wine.” Most wine on the market doesn’t throw sediment as it ages, and is meant for early enjoyment, and rarely needs decanting to soften it up. Anyway, I had an opportunity to dive into the sample box and come up with two products that claim to aid in aeration. The Patent Wine Pourer & Stopper from Wine Enthusiast. 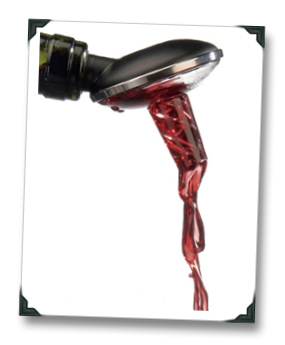 Primarily an attachment that helps prevent drips when you pour your wine, it also claims to have an extended inner chamber that aerates the wine as it’s poured. About $19. Spinwine. Looks a bit like a spaceship for small insects, with an opening at the top and a spiral insert, both of which are claimed to help expose the wine to extra amounts of air as it (the wine, not the Spinwine… or the air…) is poured into your glass. About $30. My tasting group (me + the little Dudele, who only watched to oversee the objectivity of the experiment) used a very young Malbec from Argentina, which is a wine high in tannins and was of good enough quality that we deemed it could be softened by a few hours of decanting. Three identical pieces of stemware were used, in which we separately poured the control group (straight from the bottle), the Wine Pourer / Stopper group (henceforth referred to as WP/S since I’m too lazy to type the whole thing out again), and then the Spinwine group, all into separate stemware (duh). Control – As you’d expect, the wine was good with black fruit and leather aromas, but was “tight” although enjoyable. WS/P – Pouring the wine form the WS/P was relatively easy, though the stream / flow into the glass seemed slower than normal, as if the bottle had some kind of benign prostate enlargement problem. The resulting aromas were actually more muted than the control group, prompting confused looks all-around. Spinwine – Visually, the Spinwine did an impressive job of, well, impressing the tasting group (especially our baby daughter). As the wine is poured, it hits the glass with noticeable bubbles and the spinning pour is at least entertaining. In terms of how well it aerates the wine, it clearly does something, as the wine was softer on the palate and perceptibly more open and fruitier on the nose. Having said that, the difference versus the control group was not deemed to be substantial. I’ve tried experiments like this with other aeration products before, and while they usually work, they aren’t a one-for-one equivalent substitute for decanting. While decanting was not one of the options in this little experiment, I’d be willing to bet that while the Spinwine came out on top in terms of noticeably aerating the wine versus our control group, it’s still best to decant for an extended period of time if you really want to soften up a young, tannic red. Personally, I’d avoid the WS/P altogether, unless you like your wine subdued. The assessment makes sense. For fun I made the prediction before reading the results–it came up the same. I would have been surprised to hear that either had the same effect as prolonged decanting. Prolonged being the key word there–it takes time for the interaction between air and wine to take place, that is, unless you plan on attaching a Small Hadron Particle Collider to the end of your bottle. Just curious- why didn't you do this comparison blind? What does it say about us if we're willing to dish out $20-$30 for these gadgets rather than spend a similar sum (or a little less) on a basic decanter?…..
How do you think the Spinwine compares to the Venturi, arguably the 'gold standard' for these types of add-ons? Curious to hear your thoughts . 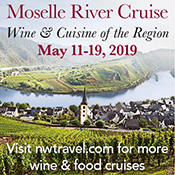 . .
Also, did you taste the wines immediately in glass or wait awhile? And if immediately, did you go back to the wines later to see if any differences could be detected? Curious to hear . . .
Hi Larry – I did taste immediately and then went back. I haven't tried the Venturi so can't say, though I did try the soiree and I think that one might be better than the two compared in this post. Or even a nondescript decanter! I usually don't have the time to decant – mainly during the week (sometimes out of impatience). I like my Vinturi – maybe because of the cool sucking sound it makes. I think it enhances the taste and smell a little bit. But, I guess we should do some blind tastings to really be definitive. 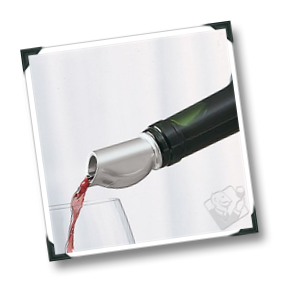 I think just using the aerators have a placebo effect on the wine tasting… So, blind would be a great idea and a good activity to do with friends! After 13 years in the production end of the wine industry and a MS in Enology & Viticulture, I've discovered something earth-shattering. When I open a bottle of wine, I pour it into a glass and enjoy it. A great wine is a great wine regardless of how long it has been decanted. High alcohol wines are best served with as little aeration as possible, as aeration promotes the evaporation of alcohol and the sensation of heat. If a wine does improve with aeration, it is simply a matter of sulfur compounds blowing off, which will happen regardless of how you aerate the wine. And one thing for sure is that these devices do not "age" a wine. Perfect example of deductive fallacy – just because the wine may taste different compared to had you not done any aeration at all, simply means one has detected a difference. That the wine is "aged" is certainly a leap of logic! Great point, Jason – decanting and aging are technically not the same thing, despite my over-simplification of comparing the processes in this post. I don't understand why you say that aerators shouldn't be used with high alcohol wines. Say, for example, I crack open an Aussie Shiraz that me and my guests find too high in alcohol content; too hot. I pour it through an aerator and it brings down the sensation of heat and we enjoy it more; what's wrong with that? It seems like a perfectly effective device and and a better experience with the wine. 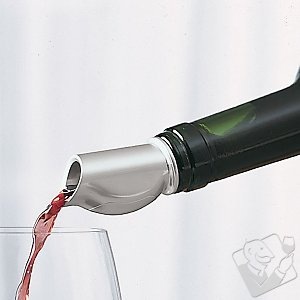 I regularly do blind tastings and experiments with these and other types of wine gadgets. I have also regularly tested the decanter theory. I am not one to trust common wisdom when it can be so easily put to a test. The easy answer? Swirling a wine in a glass does more than any of these gimmicks or even all but the longest decanting will ever do. The only time I really recommend a decanter is on wines with a noticeable aroma defect, such as too much sulfur. Then a forceable decant, so that it goes chug chug and lots of aeration happens, can help remove the offending odors. Otherwise, stick with the old swirling of a wine in a glass trick, it really makes a difference. Thanks, Stephen – just curious, have you ever discerned decanting to soften up a younger, tannic red, vs. only swirling it in the glass? I am not sure if it softens the tannins so much as releases the fruit, but yes swirling for me has produced a greater change in young reds vs. time in a decanter. The tasting is a bear to conduct, but if you ever do it, let me know. I work hard to debunk wine myths, but without peer review it doesn't matter what my findings are. Great set of possible conclusions in that post!